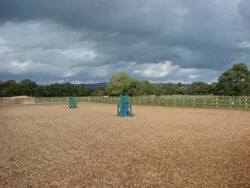 We aim to provide some of the most comprehensive livery facilities for both horse and owner. In a well maintained and tidy fully concreted well lit yard. There are very few livery yards that can provide the services we have on site here at Osbaldeston. 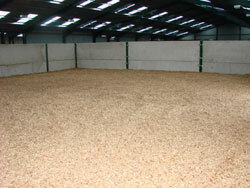 To see what you get for your money visit our livery facilities page .. Plenty of good safe hacking on private road, country lanes together with our fantastic river ride weather permitting [approximately 3 mile]. Which includes the option of wadding into the river. 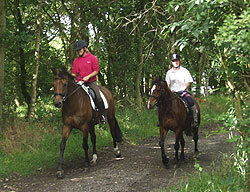 Whatever the weather you will be able to ride your horse all the year round at Osbaldeston. 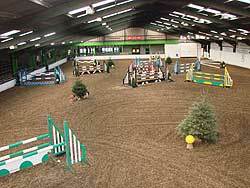 Osbaldeston offers probably the best training facilities in the area for flat, dressage, showjumping and WH. For those who wish to compete there are plenty of Novice type shows for Showjumping, Dressage, Showing and Working Hunter at all levels of riders to take part in without leaving the yard. Think of the savings no need to travel off - site to shows. On - site training is available. Livery at Osbaldeston provides a relaxed atmosphere in a beautiful country location. We are closer than you think to Clitheroe, Blackburn, Preston and all surrounding districts. When comparing livery prices please compare like for like. Cheapest is not necessarily the best.